For our anniversary, which is today, our 18th if you're wondering, we're not exchanging porcelain or garnets. 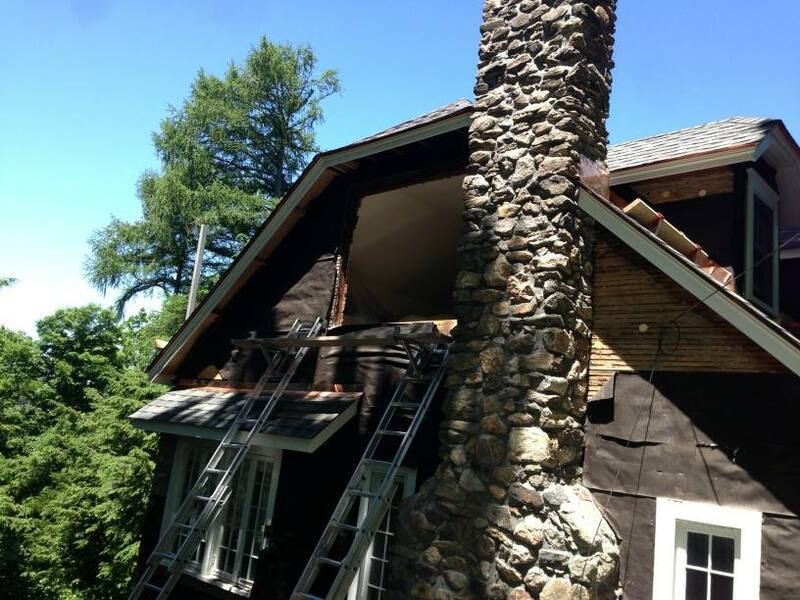 Instead, we're knee-deep in a new roof, new gutters, new stucco, a new deck, new windows, insulation (because our 1920 house had NONE), and big bills. And somehow, even though we are ostensibly doing exterior renovations, the inside of the house is torn apart in a big way. The tar paper shack, minus one bedroom window. 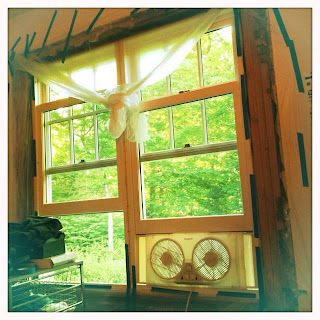 And lo, a window was installed, completed with plastic drapes. I don't know much about our house, except that was built in 1920, and that it was a kit house from Gordon-Van Tine. We'd known that the house next to ours was a pre-cut Sears kit house, but until we (that is, our contractor, not me, not my husband) took out one of our original windows, we didn't know ours was a kit too. As you can imagine, I headed straight for the internet. I bought a Dover reprint of some of the Gordon-Van Tine plans, but it didn't include anything like our our house. I found our built-in linen closet on Flickr. But it was the Internet Archive where I got closest, finding a copy of the 1926 Gordon-Van Tine catalog on that delightful electronic attic. Bingo! The Gordon-Van Tine No. 620 looks a lot like my house, but the plans are a little different. "The battered gable ends add a peculiar sense of "homeyness" to this home, which makes it doubly alluring." First off, our house is flipped, with the living room to the left of the front door (as you enter). We have a fireplace (and chimney) off the living room, the stairs don't double back into the kitchen, the coat closet on our stairs is where the stairs on the plan split into the kitchen, and we can go all the way around the ground floor. And, what the 620's plans show as a back entry is where our breakfast nook is - the house is on a hill and the first floor in the back of the house is up a story off the ground. Upstairs, we have more closets than the plans show (two in the master bedroom and another off the bathroom). 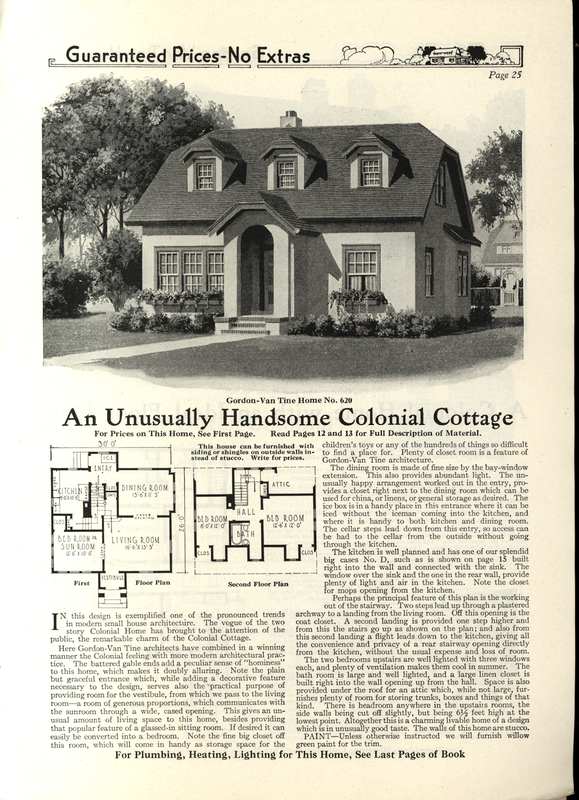 But we do have that linen closet, and we do have the three dormers, and we do have all of those clipped gables, and really, the Unusually Handsome Colonial Cottage is pretty surely the general sketch of the "charming livable home of a design which is in unusually good taste" in which we live. I love the internet. Oh, and my husband. Happy Anniversary, you! Very cool! Happy anniversary! My dad almost bought a Sears kit house ages ago but it was in terrible shape so he passed. How wonderful to search out the history of your home. While renovations make the house worse before it gets better, I'm sure the improvements and the insulation will make life more beautiful and way more comfortable. And Happy Anniversary. Fascinating! And I hope your anniversary is happy, if drafty and a bit dusty. And I love your house. First off, happy anniversary! Doesn't seem like 18 years since that wonderful wedding at the old homestead. Gotta love the internet for this stuff. Good luck with the renovations! There's some movie (my husband might know) in which a character says something like "real estate is the only thing that can truly rejuvenate a marriage." Happy anniversary and happy house! Here's hoping year 19 is less dramatic than year 18! Glad for the anniversary. Congratulations... and happy you two are together. Happy anniversary! Love the house story. Happy mutual anniversary! I think I forget every year that we share that day. Love this. We aren't doing anything nearly as exciting for ours but kudos to you--additions beat garnets any day. I love when I have no idea based on the post title what the post is going to be about. And what a lovely mix of architectural history and anniversary post. Happy anniversary! May your major renovations go as smoothly and as quickly as possible so that you may enjoy your Unusually Handsome home in Relative Normalcy.